As soon as the first monk appeared, his saffron robes brightly reflecting the early morning light, the people on the street shifted into action. 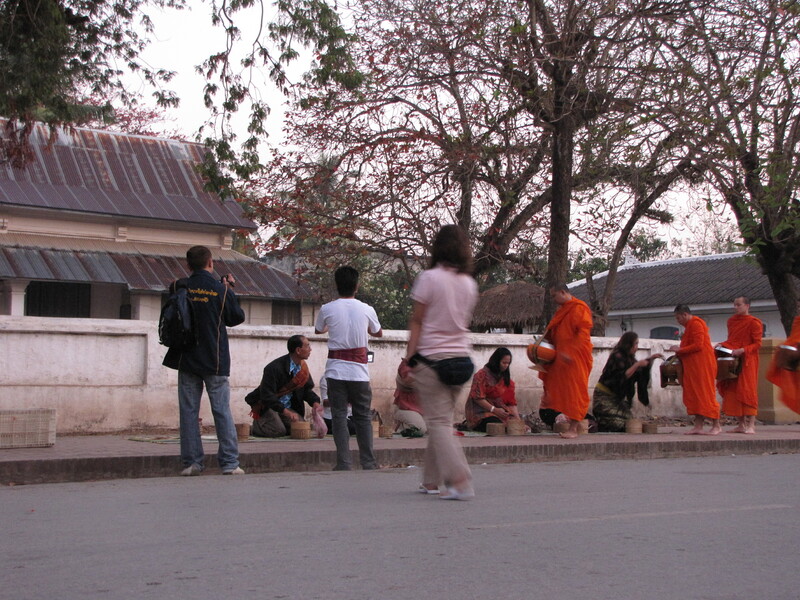 As the faithful assembled on the sidewalk, readying their wicker baskets filled with sticky rice for the monks, we tourists started jockeying for the best camera angles. 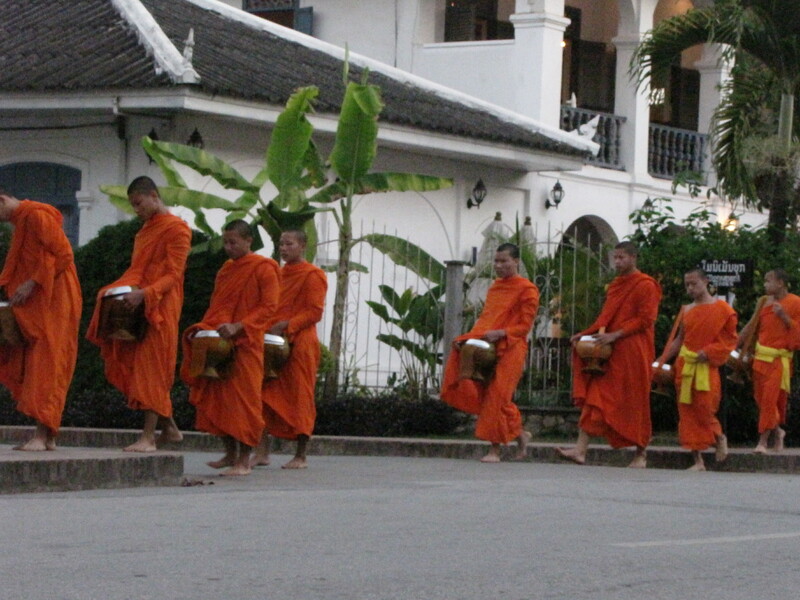 It is time for the tak bat, the daily procession of monks seeking alms from the people through the streets of the city. Luang Prabang (I’ll call it “LP” for short) has many active Buddhist temples, and for many years, the monks have taken to the street in this manner to collect alms – in the form of food – from the townspeople. Another fellow, with a camcorder on a large tripod, set up right in the monks’ path and did not move his camera until the last possible moment. One French gentleman was speaking very loudly to his companions until another tourist crossed the street to tell him to be quiet; he responded to her with a “merci” that could be heard down the street. Plenty of foreigners bought cheap sticky rice from street vendors so they could insinuate themselves in the ceremony, even though the custom is to buy quality rice at the market and prepare it oneself. What had been moments earlier a somewhat peaceful gathering prior to a religious ceremony had turned into another fun diversion for tourists. That sign is in guesthouses, restaurants, the tourist office, and most Buddhist temples. Somehow the message just does not seem to have gotten through to people. I find it hard to believe that so many people who attend the tak bat seem to be oblivious to the impact their conduct has on both the beauty and the dignity of this ceremony. I try not to grouse about other travelers’ behavior here. We all have our badly behaved tourist stories, and on this trip, Kara and I probably have too many to write about here. Here, though, inconsiderate tourists are damaging the very thing they came on vacation to see. So many unique customs, around the world, get turned into tourist attractions. Kara and I have traveled to many places where you can pay a few dollars and you can see a wedding (which is probably not real and staged specifically for tourists), or a traditional dance and even a funeral. So many times, you watch these things and you can see on the faces of the participants that it is pure performance, not done out of any sense of tradition, but only as a means of profit. It is truly unusual to be admitted to a real, live ceremony, one performed for its own purposes rather than the entertainment of a paying audience. When I watched the conduct of my fellow travelers at the tak bat, I understood why. I’m saddened to see it’s gotten so bad with Tak Bat. I feared as much in Vientiane, because even there, there are some efforts being made to sensitize the tourists to this. 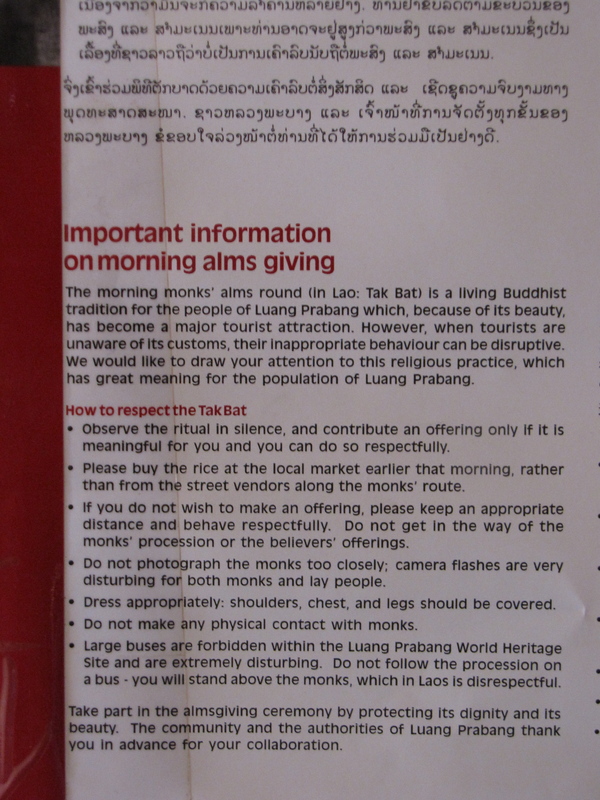 I hope Laos manages to force some sense of respect and human decency out of their tourists. One place that seems to have succeeded in Ubud, in Bali: although it’s heavily touristy, you get a sense that most people come here for the culture; that was achieved through great effort by the Ubud residents, who deployed great effort to educate the tourists. Prior to this, they were disrupting religious processions and weddings and acting like asses. I’m always shocked by the kind of behavior you describe. Then I realize that for many travelers, travel is a consumer product, whose leftover is pictures. It breaks my heart. The same thing used to happen to Catholic monks in the US–I can tell you stories another time, from the days of my youth.